A breakthrough in fibre optic technology could see us all get a huge boost in internet data speeds, and even enable full high definition streams to be piped directly into our homes. Fibre optic specialist Corning, Inc . says the new cable is 100 times for flexible than current standards. This enables the cable to be bent at right angles without causing excessive amounts of light to be lost. 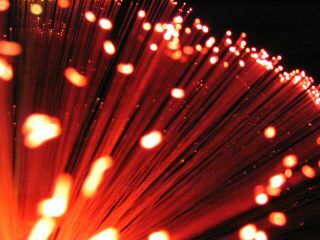 In fibre optic networks, data is transmitted using light passed along the cable so any light loss can be catastrophic. This in turn makes fibre optics complex and expensive to install, which is why most of us stil have cheap and very flexible copper cable running to our homes. The new Corning cable - developed in conjunction with Verizon - uses nanotechnology to achieve its flexibility, and without compromising data integrity or speeds. "This is a game-changing technology for telecommunications applications," says Peter F. Volanakis, president and chief operating officer at Corning. "We have developed an optical fibre cable that is as rugged as copper cable but with all of the bandwidth benefits of fibre." Verizon plans to roll-out the new cable as part of a country-wide initiative to install its FiOS fibre optic network to homes ( FTTH ) across the United States. Corning's technology will be particularly applicable for use in apartment blocks and condominiums according to Verizon. "We are working closely with Corning to solve the challenges of providing fiber solutions to high-rise apartment complexes across the United States. This fiber technology will enable us to bring faster internet speeds, higher-quality high-definition content, and more interactive capabilities than any other platform which exists today."